CUPERTINO, CA -- (MARKET WIRE) -- October 5, 2005 -- Symantec Corp. (NASDAQ: SYMC) today announced Norton SystemWorks 2006 and Norton SystemWorks 2006 Premier. The latest versions of Symantec's award-winning data protection and problem-solving solutions provide consumers greater, more adaptive information protection with minimal user interaction. "PC health is a crucial part of protecting the valuable data stored in consumers' computers. Symantec recognizes the growing importance of a solution like Norton SystemWorks 2006 to help provide proactive data protection and necessary system maintenance," said Matthew Moynahan, vice president, consumer products and solutions, Symantec Corp. "Consumers can turn to Norton SystemWorks 2006 as a first line of support for diagnosing, repairing and maintaining their computers' health and keeping their data safe." When it comes to system maintenance and data protection, consumers need a hassle-free solution that is proactive and flexible enough to accommodate different user environments so consumers are free to turn their attention to other matters. Rather than spending time trying to determine whether their system is running at its best or figuring out how to fix an existing problem, consumers need a single destination that summarizes and communicates their computer's status. In addition, consumers need to be able to understand which technologies protect which activities. To address this need, Norton SystemWorks 2006 features Norton Protection Center. This intuitive dashboard gives users a clear, concise summary of what they need to know regarding system and data security, helping ease the difficulty of keeping their systems up, running and protected. The latest version of Norton SystemWorks introduces automatic installation of Norton GoBack, Symantec's powerful data protection and recovery product, to provide out-of-the-box continuous rollback. Norton GoBack proactively monitors the system for installation of software and reminds users they can roll back in the event of a problematic installation. This feature protects the system from damage caused by installations of faulty software and potentially unwanted programs such as spyware and adware. To ensure more adaptive and personalized protection, Norton SystemWorks 2006 enables configurable Internet clutter and unwanted file removal capabilities through Norton Cleanup. Consumers can remove Internet clutter, their most recently used files, media file logs and temporary files, helping to keep their PC clean, improving their system's efficiency and protecting their privacy. Consumers can also automatically import "favorites" and "trusted sites" to the exclusion list, ensuring they are not deleted when cleaning up. Norton Cleanup also offers removal capabilities that can be set for all users or the existing user of the computer. Access to Norton Cleanup is now more convenient. Consumers can run Express Cleanup directly from Internet Explorer or from the product CD-ROM with no installation required. Norton Cleanup is compatible with Mozilla, Firefox, Netscape and Internet Explorer browsers. Norton SystemWorks 2006 includes Norton AntiVirus 2006, which is also available as a standalone product and as a component of Norton Internet Security 2006. Norton AntiVirus 2006 automatically protects computers from threats and risks such as dangerous spyware and unwanted adware and addresses their impact on the system's registry, processes, files and more. Norton AntiVirus 2006 works continuously in the background, providing automated, up-to-date protection to make security easier than ever. Norton SystemWorks 2006 offers consumers the trusted tools in Norton Utilities to optimize and fix their hard drive. In addition, the product makes checking the status of their system and repairing problems easy with One Button Checkup, a customizable feature that scans for problems, reports on issues found and allows users to choose whether or not they want to fix the problem in just one click. Norton SystemWorks 2006 includes Process Viewer 2.0, which identifies processes running at a specific point in time, allowing consumers to easily see what software processes are running on their system and which processes are impacting overall performance. Also included in Norton SystemWorks 2006 is System Optimizer 2.0, a powerful program that allows users to turn on and off almost any Windows XP shortcut, customizing the Windows environment to accommodate their needs. In addition to all the features in Norton SystemWorks 2006, Norton SystemWorks 2006 Premier also includes Norton Ghost 10.0, which provides adaptive and personalized protection through best practice media detection, recovery points, event-triggered backups and performance throttling. Norton Ghost 10.0 is easier than ever to use, featuring a simplified interface, an intuitive setup wizard and optimized recovery point storage. In addition, to provide added security and data protection, Norton Ghost 10.0 supports encryption of 128-, 192- and 256-bit strengths. Norton SystemWorks 2006 Premier also includes Symantec Recovery Disk, which features an enhanced interface that makes recovery fast and simple by categorizing and organizing tasks associated with recovery. In addition, Norton SystemWorks 2006 Premier users benefit with Performance Test, a helpful program that evaluates a PC's system and hardware performance, comparing them to other systems. Norton SystemWorks 2006 and Norton SystemWorks 2006 Premier are backed by Symantec Security Response, a team of dedicated intrusion experts, security engineers, virus hunters and global technical support teams that work in tandem to provide extensive coverage for enterprise businesses and consumers. Symantec Security Response provides customers with comprehensive, global, 24x7 Internet security expertise to guard against today's complex Internet threats. Symantec Security Response delivers knowledgeable, proactive security protection through product security policies and best practice guidelines that can be updated and distributed through automated processes. Additionally, Symantec Security Response provides rapid security protection through its incident response program, including emergency antivirus signatures, definitions and policies as well as outbound communications such as alerting services. Norton SystemWorks 2006 and Norton SystemWorks 2006 Premier are available for pre-order through the Symantec online store at www.symantecstore.com. The products are scheduled to be widely available for purchase at retail locations and online retailers in late-October. 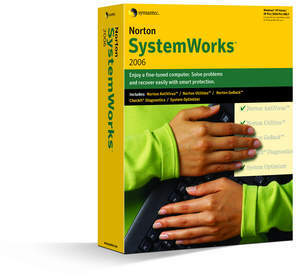 The estimated retail price for Norton SystemWorks 2006 is US$69.99. The estimated retail price for Norton SystemWorks 2006 Premier is US$99.99; 5- and 10-user Norton SystemWorks 2006 Premier Small Office Packs are priced at an estimated US$349.99 and US$649.99 respectively. Current users of Symantec products as well as users of competitive products will be able to upgrade to Norton SystemWorks 2006 or Norton SystemWorks 2006 Premier for an estimated retail price of US$49.99 or US$79.99 respectively. Prices for Norton SystemWorks 2006 and Norton SystemWorks 2006 Premier include a one-year subscription to Symantec's protection upgrade. Symantec is the world leader in providing solutions to help individuals and enterprises assure the security, availability, and integrity of their information. Headquartered in Cupertino, Calif., Symantec has operations in more than 40 countries. More information is available at www.symantec.com. NOTE TO EDITORS: If you would like additional information on Symantec Corporation and its products, please view the Symantec Press Center at http://www.symantec.com/PressCenter/ on Symantec's Web site. All prices noted are in US dollars and are valid only in the United States. Symantec, the Symantec logo, VERITAS, and the VERITAS logo are trademarks or registered trademarks of Symantec Corporation or its affiliates in the United States and certain other countries. Additional company and product names may be trademarks or registered trademarks of the individual companies and are respectfully acknowledged.